After winning their first match against Guam last Tuesday, September 25, 2012, Philippine Azkals took another win Yesterday against their opponent team Macau in a 4-nation Philippine Football Peace Cup event with a stunning score of 5-0 (w-l) goal. It was a breathtaking game match from Azkals who gave Macau a hard time coping up in the play. The first two goal made by Azkals was offered by Azkals forward, Denis Wolf a 29-year-old Filipino-German. For the third goal it was Carli de Murga’s turn to give the team another goal in that match. In just 48 minutes of the game, Azkals have manage to give their viewers a good game shocking Macau with 3 consecutive goal before an hour of playing. For the fourth goal, it was Wolf again who put the ball inside the net. That means, Wolf have given Philippine Azkals a 3 goals sure shot in this game event. As for the last goal before the match between Azkals and Macau ended, Patrick Reichelt gave another goal for the team. That made the game match result of 5 - 0 (win - lose) score between Azkals and Macau. Well, that's a great news for all the fans of the Philippine Football team. 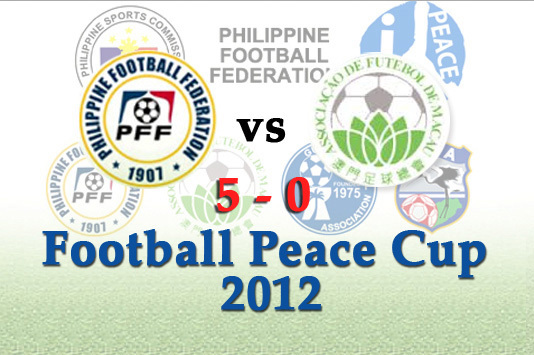 Tomorrow, they are set for their last game match on this Football Peace Cup 2012 event against the team of Chinese Taipei. Hope that they'll give another stunning play for their viewers in Rizal Memorial Stadium in Manila. Comments or suggestions about "Philippine Azkals win over Macau in Football Peace Cup 2012" is important to us, you may share it by using the comment box below.